Discussion in 'Articles' started by Jared Grubbs, Oct 27, 2018. At last, it's finally here! It's finally time for more Butler basketball. We can move from the realm of hype and speculation to the real world where the players at last get the chance to prove themselves on the basketball court. But before we do, I want to make a few player predictions of my own and take a look at 3 Bulldogs I think are poised to exceed fan expectations and 3 players who I fear Butler fans might be hyping up just a little too much. I gave consideration to several players for inclusion in the top half of this list, but I knew right from the beginning Jorgensen was being placed right on top. I'm so excited to watch him this season, I nearly made this an entire article just about him. I firmly believe he is one of the most overlooked players in the league. Overall Jorgensen had a fairly solid year last season, averaging 10.2 points per game while shooting 50% from 2 point range and 35% from 3 point range. Unfortunately his season was littered with inconsistencies. Jorgensen is a rhythm scorer though, and I believe those inconsistencies will fade away as he gets more scoring opportunities. Last season there were 8 games where the Butler guard attempted 6 shots or fewer. Jorgensen shot 19% from the field and averaged 2.8 points in those games. There were 12 games on the other end of the spectrum where Jorgensen took 10 or more shots per game. In those contests he shot 47% from the floor (38% from 3) and scored 14.3 points a contest. Coach Jordan is going to give Jorgensen the green light to take more shots this season, and I expect both his confidence and his efficiency to go up as a result. I've been giddy about the future of Aaron Thompson since the first game I saw him in a Butler uniform. Then he went 5/6 and scored 15 points in only the second game of his career against Princeton, and I wondered if Butler might have it's next freshman star. Turns out that was a little premature, as Aaron really struggled to put the ball in the basket for most of the season. He did an outstanding job of penetrating into the lane and absorbing contact at the rim, but the freshman simply had trouble finishing. He shot only 46.3% on field goal attempts at the rim and 53.9% from the charity stripe, both team lows by a pretty wide margin. A lot of fans, myself included, are hoping Thompson will improve his 3-point shooting to at least require teams to guard him on the perimeter, but the bigger key this season is simply going to be knocking down the easy ones. The biggest jump in player development typically comes after the freshman season, so don't be surprised to see Thompson take a huge leap forward. If he can give Butler any type of boost on offense to go with his pesky perimeter defense he can turn into one of the most valuable guards in the Big East for the Bulldogs. Of course a controversial topic such as this one wouldn't be complete without involving Nate Fowler. Without a doubt the most polarizing player on this Butler roster, Fowler's play has been a hot topic on the message board for the past two years. One side is constantly frustrated with Nate's "soft" play in the post and below average rebounding skills in the paint. The other side is enthralled by the advanced numbers that he has consistently posted during his time at Butler. Fowler led all Butler players last year in point differential per possession (+/- adjusted for number of offensive and defensive possessions) after finishing 2nd the year prior. He has also consistently graded out as the best post defender on the roster despite the impression that he is an offensive only player. With Tyler Wideman gone the center position is all his, and I think he's going to take advantage with a tremendous year. Will this finally be the year Nate Fowler is fully embraced by the entire Butler fan base? You might not find a bigger fan favorite than Southport's Joey Brunk. As a local top 100 recruit with a likable personality who was forced to fight through his father's battle with cancer early in his career, it's easy to see why Butler fans have taken a liking to Brunk. Many were extremely critical of LaVall for not getting him more playing time last season. Brunk only saw action in 20 games, averaging 5.5 minutes per game in those outings, almost all of it coming in meaningless minutes. Those numbers figure to skyrocket this year due to the graduation of starting center Tyler Wideman, so he's going to get his chance. My concern with Brunk isn't necessarily his skill development though, it's his fit with Coach Jordan's style of play. LaVall appears to be moving the program to a more spread out, up tempo style of offense similar to what we see from Villanova. He wants to open up the floor for playmakers and become more versatile on defense. None of that really describes Brunk, who is more of your "old school" type of center. It's going to be interesting to see how Brunk gets utilized, and how willing Coach Jordan is to go to a small lineup without a center should his backup big man struggle in just his sophomore campaign. I'm extremely excited about Tucker's career as a Bulldog, but I'm a little concerned fans might be expecting too much, too soon. 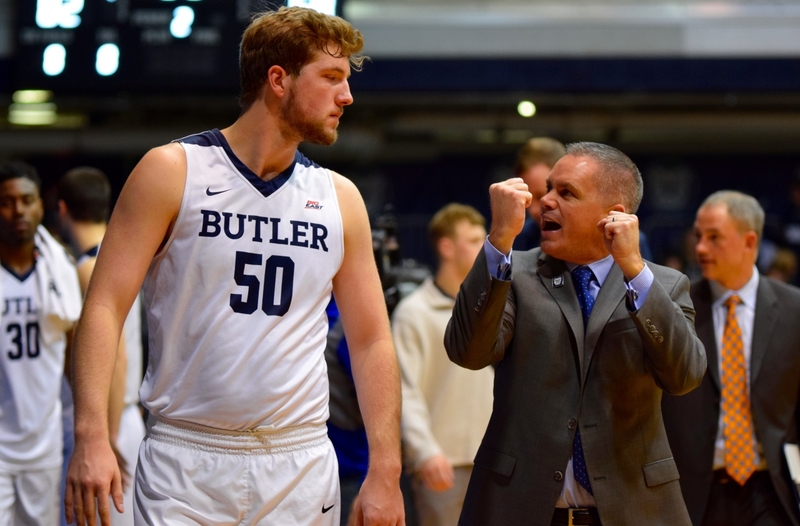 The departure of Kelan Martin has left a scoring void that needs to be filled, and it's only natural to turn to one of the highest ranked recruits in Butler history. Tucker is a scorer and an elite level shooter who will be able to take some of the pressure off of Kamar Baldwin, but is he ready to step in and be a double digit per game scorer his first year in the program? That's certainly a possibility, but that probably shouldn't be the expectation for a player with 14 minutes of game experience at the division 1 level. It's certainly fun though to think about the possibilities both immediately and in the future if Tucker is that type of impact player from day 1. If Tucker averages over 10 points a game this year Butler will be fighting with Villanova for a league title. The inclusion of McDermott on this list may shock many who have followed my posts on the board over the last several seasons and will serve as evidence that I really struggled to come up with a third and final name to place here. I was one who defended McDermott back when fans criticized Coach Holtmann for redshirting McDermott, because they didn't want an additional year of someone who supposedly couldn't play at this level. He proved the doubters wrong and stepped up big time with an extremely efficient offensive season, shooting 68% from 2 point range, 43% from 3 point range, and finishing the season with the 3rd highest offensive rebounding rate on the team at 6.1%. So why do I think expectations might be too high for him entering the season? Because a lot of fans are ready to see him take on a larger role in the offense. I think Sean's role last season was perfect for him though, and I'm not sure it would be beneficial to move him into a more prominent one. It's natural to want a player scoring so efficiently to get more shots, but I'm not sure it's that easy. McDermott isn't the type of player who is going to get his own shot. Most of his shots came on open catch and shoot 3 pointers, and while it would be outstanding to get him more of those, they are hard looks to come by. So while some may be hoping McDermott can expand his offense to help make up for the loss of Kelan Martin, I'm simply hoping Sean can duplicate the excellent offensive efficiency he displayed last season. kmacker69, MSUDawg, #60 and 1 other person like this. jared, I'm not sure if you know this, but the season hasn't started. Therefore, nothing critical may be said. A little early for up and down. I have a question, Isn't there a picture of Brunk with Jordan rather than Holtmann? Just asking. They are my predictions of which players I’m higher or lower on than what I’ve seen from other Butler fans on average. I wanted to get these out before any games started. As for the picture, we don’t have a lot of our own pictures from last season because Julia had a baby during the season. I chose this picture simply because I liked the look ok Brunk’s face and thought it fit. I pictured that as his reaction to this article! I was expecting a lot of complaints about the article, since the entire point was choosing players where my opinion differs in some degree with a lot of other fans. I can handle it, no big deal, and hopefully some good discussion can come out of it. What I didn’t realize is that the most popular reaction so far would be regarding Holtmann being next to Brunk in the picture. Ref Aaron Thompson. He should get more fouls called on his drives this season as a known player. If he converts free throws at say 70%, that solves everything. His driving efficiency is automatically improved and it means his stroke is moving in a positive direction. To me it says the shot will come around too. So free throw percentage would be the highest upside improvement imo. As to everyone else, I’ll just wait and see what happens. Starting today. MSUDawg and kmacker69 like this. I think McD might have the type of season we always hoped that Kellen D would have, but he got so much attention that he never had a chance to be open very often... Since Sean will not be the center of attention, he might just make it a pick your poison with Baldwin and Thompson able to drive you to the hoop or McD and Paulie J ready to hit the open shot if you help cut that off. Although that might be why your saying to temper our expectations on Sean? The centers like usual just need to play good D and be ready to catch the ball and score when their defender helps off. I think both can do that this year, but we shall see. Fowler dragging his man out to the 3 point line will open up the middle more, so hope he hits his 3's this year when he shoots it. Don't these lists depend on the type of offense(s) Jordan runs, or not? And if there are at least a few sets to play to the strengths of certain players. I think that will determine these lists more than anything once the season begins. Example, biggest misuse of a Butler player in recent memory was Holtmann turning spot up deadeye Dunham, who had no handles, into a one on one, create your own shot player. Since Holtmann had been around the state for years, you wonder if he ever saw how Knight used Alford, who also had no handles, at I.U. This year, I'm probably more interested to see how Jordan coaches to his talent as I am the performance of the players. That may be the biggest factor on the success of the season. Interesting list. Everyone knows how I feel about Fowler. All I will say is I hope I'm wrong and everyone else is right. Now for who I think will be the most improved I'd rank them this way- McD, Brunk, PJ, Baldwin , Gillens -Butler. Leaving out Fowler those who won't have improved sufficiently in order- Thompson, Baddley and David. There are certainly plenty of unknowns on my end to know what is going to happen. It’s a pretty safe bet at least one of these will end up in the Cold Takes thread. It’s no fun predicting and debating if we know everything though. I would agree it’s going to be interesting to see what Jordan does. He’s recruiting more up tempo players than we’ve seen in the past. Last year’s team played the 2nd fastest tempo in the KenPom era, but it was still slow. Will it get even faster as he starts to get “his guys” in there.